How Can You Eat a Book? Make It Out of Food! On March 21, 2008, as I was leaving Forbes Library in Northampton, MA, I noticed what looked like a bag of popcorn in a cake holder at the check-out desk. Next to it were flyers advertising a fund raiser; a handout entitled “The Friends Edible Book Event Guidelines” said “your edible book is your interpretation of a book you find of interest.” Entries “must be 100% edible and preferably fresh!” The popcorn bag was an interpretation of Tomie dePaola’s The Popcorn Book, a cake and covered with red and white striped fondant with real popcorn overflowing the bag. Edible books have been around formally at least since the turn of the millennium, when co-founder Judith Holmberg of Santa Monica, CA got the idea during a 1999 Thanksgiving dinner with book artists. The festival honors French gastronome Jean-Anthelme Brillat-Savarin (1755-1826), famous for his book, The Physiology of Taste. Since 2000, Edible Book events have been held in Australia, Brazil, Germany, India, Japan, Mexico, Morocco, and Russia. The organizers are generally art centers, academic institutions, restaurants, and book arts spaces, and sometimes libraries. More info about the international event can be found at the books2eat website. 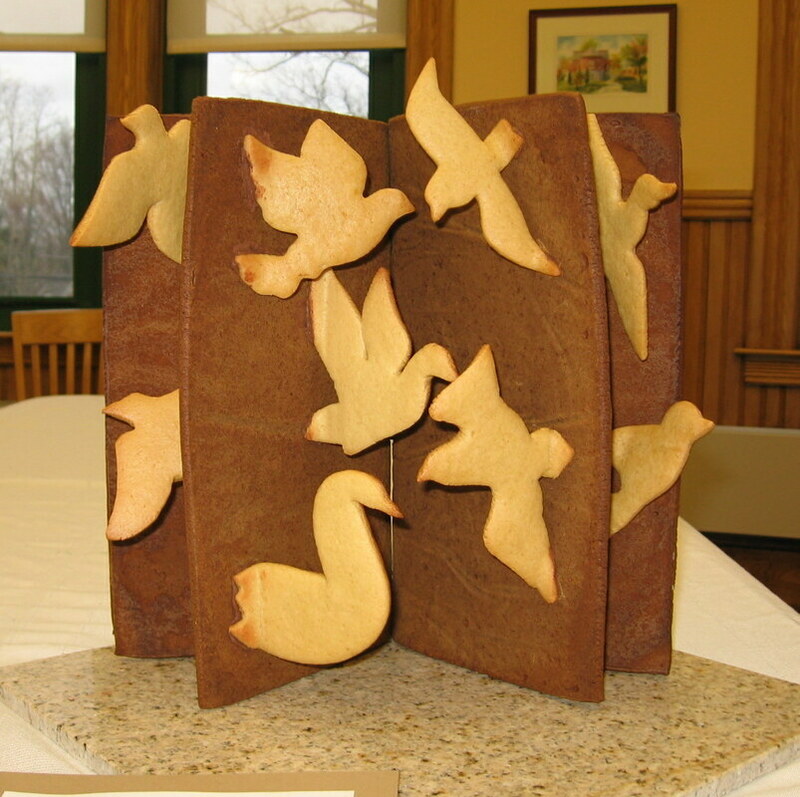 Here in Northampton anyone can create an edible book: kids, adults or any combination. Attendees (who don’t have to be creators) get to admire the entries, and judges come up with clever awards for each. Then everyone chows down and eats the ‘books’! 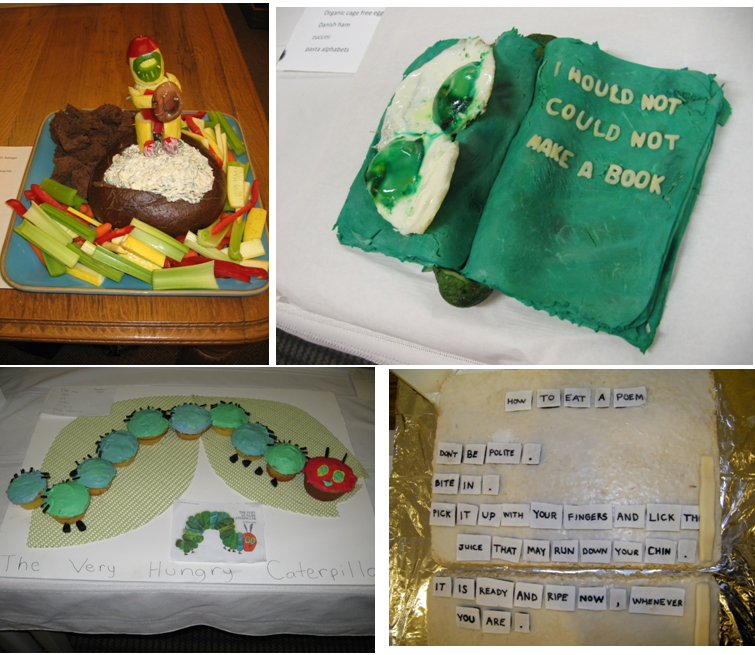 Past entries and awards have included a Catcher in the Rye made out of vegetables, dip and rye bread [‘Best Veggie Pun’]; Dr. Seuss’s Green Eggs and Ham made of green eggs and ham [‘The Al Gore “Let’s Be Green Award”’]; a Very Hungry Caterpillar fashioned from cupcakes; and "How to eat a poem" in which the words of the poem were inscribed on refrigerator magnets made of chocolate wafers covered with white icing [‘Most Metaphorically Layered’]. You can see photos of past entries at the Edible Book Northampton Facebook page. 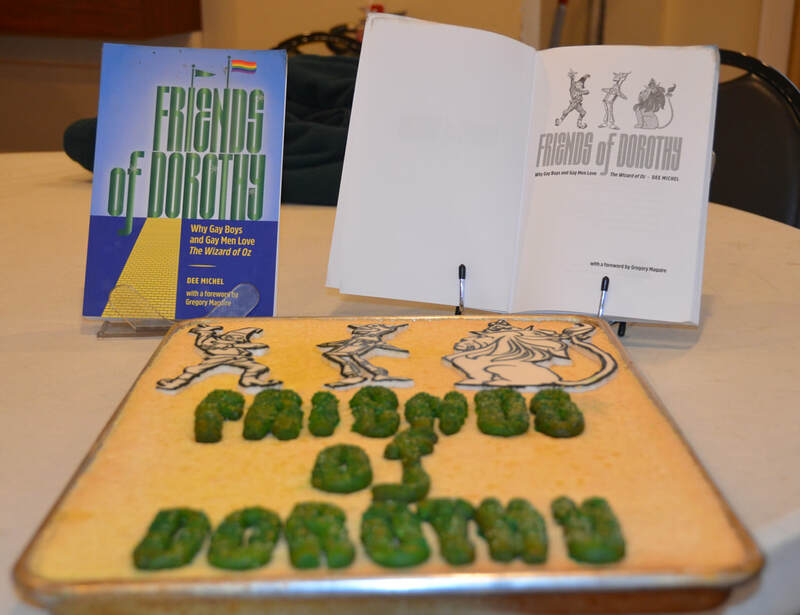 This year I created an edible Friends of Dorothy and enlisted the help of Scott McDaniel, my collaborator on Birds of America. We used images of Dorothy’s companions from my title page. They were made out of fondant decorated with black food color markers. The title cookies were based on the shiny green letters on the cover that look like an Emerald City. I made gingerbread with honey instead of molasses and with green food coloring, sprinkled with green shiny sugar sparkles. They were set on a jelly roll sponge cake, to represent a page in a book. 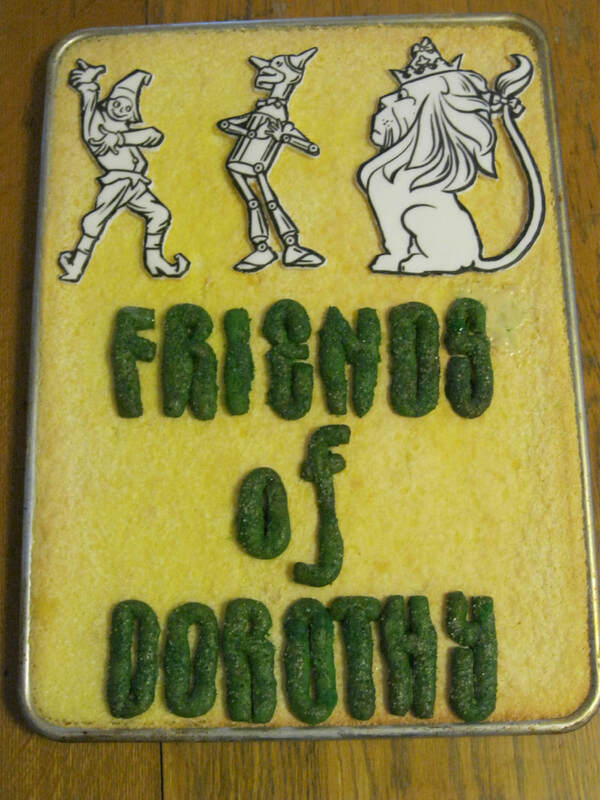 Our Friends of Dorothy was awarded ‘The Follow the Rainbow Brick Road Award.’ Most of the title was consumed at the event, but a week later, I still have a fair amount of sponge cake and much of the three companions. The cake may end up in tiramisu. Three far-flung women have recently made fascinating use of my research. 1 Dialog is a Polish journal on modern drama, theatre and film, with a bit of cultural anthropology and critical studies; they publish both plays and essays. The October issue is devoted mostly to queer theatre and includes a new play. The October issue is devoted mostly to queer theatre and includes a new play by Pawel Soszynski that uses imagery and quotes from The Wizard of Oz. 2 The rabbi at Beth Chayim Chadashim, the LGBT synagogue in Los Angeles is Lisa Edwards. She attended my August talk at the West Hollywood library and bought a copy of my book. In a recent Rosh Hashanah sermon, she spoke about the concept of home, and talked about The Wizard of Oz, holding up my book for the congregation to see. 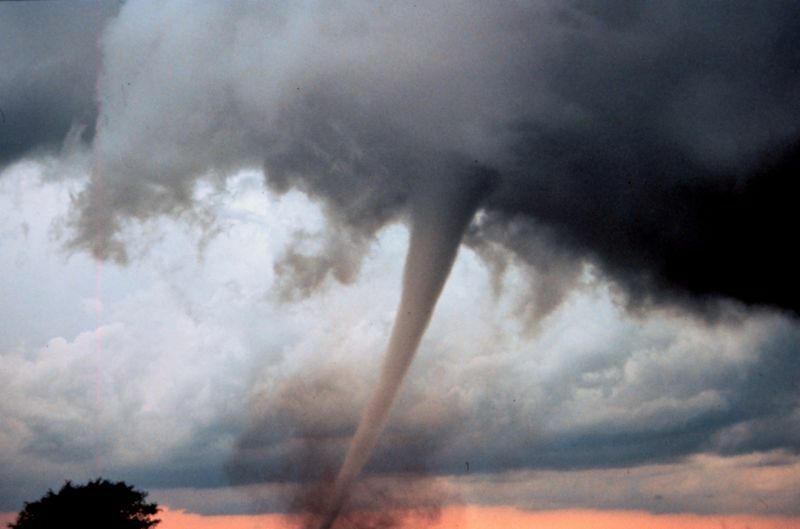 Her online notes for that day begin with the lyrics to “Dorothy,” a song by Hugh Prestwood that Judy Collins recorded. 3 Dina Schiff Massachi teaches about Oz in two classes, ‘Oz: An American Fairytale’ and ‘American Fairytales in Fiction and Film’ in the American Studies Dept. of the University of North Carolina at Charlotte. As a member of the International Wizard of Oz Club, she receives the Baum Bugle and read my article on the Oz-gay connection. In her classes and conference presentations, Massachi often discusses the themes that appeal to gay men that I lay out in my article. This past August, I did my first book tour. The International Wizard of Oz Club was holding its annual convention in Pomona, which is about an hour east of LA. I was on the program to talk about my book, and also had a special book signing slot in the dealers room. My friend, retired librarian Steve Klein, put me in touch with the West Hollywood branch of the Los Angeles County Public Library, and we scheduled a reading. 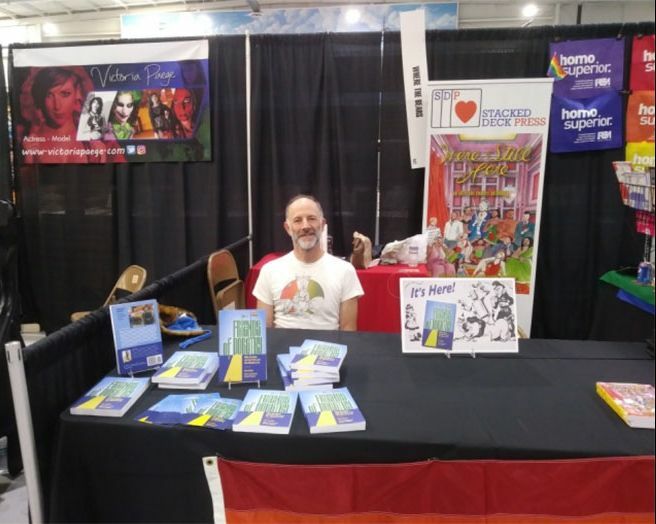 Palm Springs was hosting a ComicCon, and the Prism Comics folks who support queer fans and creators invited me to join them at their table. I now had three venues: the OzCon at Cal Poly in Pomona, West Hollywood Library and ComicCon at the Palm Springs Air Museum. This lead to an almost 3-week trip to Southern California, flying in to LA on Aug. 8 and out of Palm Springs on Aug. 27. I got a rental car at the LA airport and spent the afternoon of Wed Aug. 8 with my cousin Margot Parker, who was delighted to learn about my reading in West Hollywood. Then stayed overnight with my friend David Chun in Santa Monica, who put out his copy of my book for me to sign. Drove to Pomona on Thursday and checked in at the Kellogg West Conference Center at Cal Poly. Oz Club Board member Gina Wickwar couldn’t attend and was greatly missed. Angelica Carpenter, another Oz Club friend, suggested I donate a book to Gina and Angelica would have all the Board members sign it. So I dropped into the Board meeting to offer a book. I was at our sale table for much of Saturday. Angelica’s husband Richard and I managed to get the Square hardware and software to work to take credit cards. I sold and signed almost 20 books, which folks said was excellent. On Sunday I was on a panel Angelica chaired about marriage in Oz. ​The discussion was very thoughtful and after my summing up, everyone went away saying what a great session it was. During the convention, I managed to catch up with many old Oz friends and made some new ones as well, and appeared in a nice blog post. I was back in LA from Mon Aug 12 to Thurs Aug 23. I saw cousins and old friends from high school and college, bought show tune recordings at several used record stores, and went country dancing and inside roller skating. When I explained I was in Southern California on a book tour for FRIENDS OF DOROTHY, many folks expressed interest in my book and I got to give them shiny marketing cards. I was staying at a B & B in Silverlake, and took photos of where I used to live, and of the neighborhood in general. Had lunch with a college friend in Culver City who took a photo of me under the MGM rainbow. ​​Also had a great dinner chat with Oz fan Adam Browne, who had taken time off work in LA to attend my talk in Pomona. The reading in West Hollywood went really well, with great audience reactions and questions after and maybe half a dozen books sold. On Friday Aug 24, I drove to a very hot Palm Springs. ​​​The house where I stayed was gorgeous, with a nice pool. It turned out the Air Museum, where the ComicCon was, exhibited aircraft, not types of air.  It was fascinating to see all the folks in costumes, many of which I didn’t recognize. While I didn’t sell any books, two people were at least interested. ​The event and marketing coordinator for Peepa’s, a new store in Palm Springs, was very excited by my title and assured me the store owner would want to carry it and have me in to speak. I also managed to get the head of the Palm Springs Public Library interested in the book enough to maybe order it. 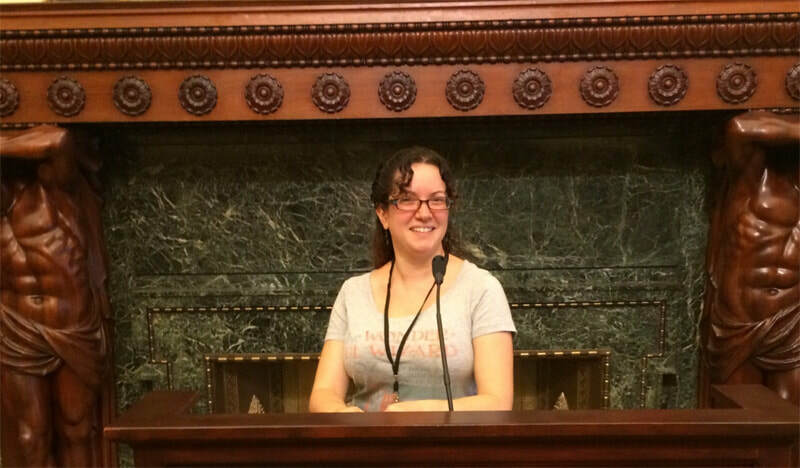 One thing I learned was to contact all possible venues in advance to try and set up readings in/with as many places as possible: bookstores, libraries, Oz organizations and gay groups. 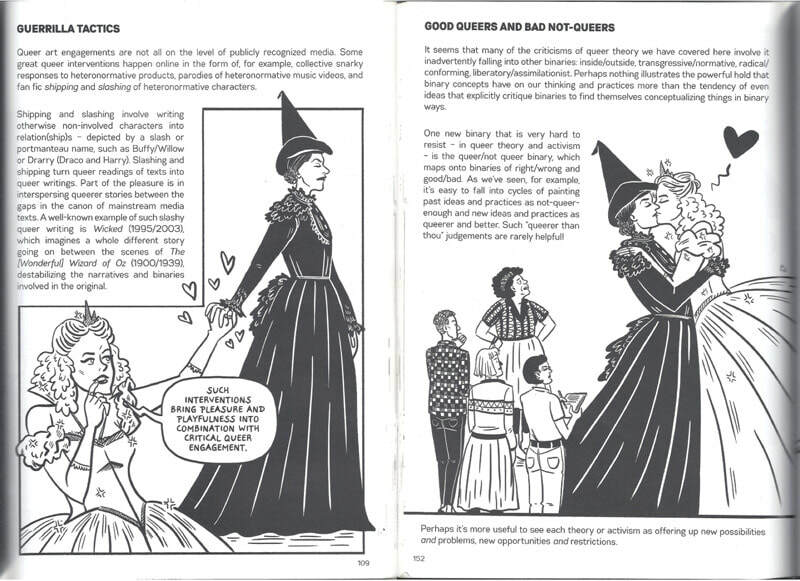 The 2016 publication of Meg-John Barker and Julia Scheele’s Queer: A Graphic History (London: Icon Books) shows that stories set in Oz in general and the MGM Wizard and Wicked in particular still have a special place in current queer culture. It contains 171 pages of graphic novel type images. Seven allude to the MGM Wizard, with depictions of the Emerald City, the Yellow Brick Road, the Scarecrow, Flying Monkeys, a melting witch, and shiny shoes. Two others are of the main characters in Wicked, Elphaba and Glinda. ​​The MGM Oz and Wicked are mentioned on page 109. A well-known example of such slashy writing queer writing is Wicked (1995/2003), which imagines a whole different story going on between the scenes of The [Wonderful] Wizard of Oz (1900/12939), destabilizing the narratives and binaries involved in the original. As far as I can tell, there are no other recurring images related to any other stories in any medium. At the Amazon page for my book, you can explore both print and digital versions of the book. I will describe the functions as I see them on my browser, Firefox. It might be somewhat different for you in another browser. 1) There is a BOOK SECTIONS window on the left. Certain parts of the book are listed that you can travel directly to. ​2) You can SCROLL through the pages that get displayed by using the down arrow on the bottom right. 3) You can JUMP from page to page with the blue left and right arrows. ​4) The TABLE OF CONTENTS (second page after cover) has most chapters, appendixes and sections highlighted and you can jump directly those. 5) There is a SEARCH INSIDE THIS BOOK window on the left, below BOOK SECTIONS. Words entered here will be matched against the complete book. So, for example, if you search on “rufus,” you will get 14 results, some of which are highlighted blue and clickable, and others are grey that you can’t see the page of. The page for the first blue ‘hit’ is displayed to the right. 6) SURPRISE ME is another option that shows up in various places in addition to being listed in the BOOK SECTIONS window. There is the same “look inside” logo. This puts you in a continuous set of unnumbered pages called a “sample” that goes up to what would be page 21. You land at the beginning of the Foreword, where the text of the book begins. 1) You can SCROLL back to see the earlier pages such as Table of Contents, or go forward for more text. 2) You can JUMP to the next or previous screen with the blue left and right arrows. The next screen overlaps a few lines with the previous screen. 3) The two SECTIONS listed take you to the cover and the beginning of text (in my case, the Foreword). 4) There are LINKS in the lists before the Foreword, such as the Table of Contents and list of Figures, but they work for pages in the sample. Links to outside the book work, such as those to my website and Dark Ink Press. Explore! Poke around! Discover! Have fun! Getting FRIENDS OF DOROTHY off the ground. The last week has been a whirlwind of marketing activity and preparation for the big release day, this past Tuesday. I have been working closely with Nate Jasper, my website and social media guy, of Design Northampton and Kate Anderson, of Dark Ink Press. We have been planning bookstore readings, posting to Facebook, creating mailing lists, sending out email blasts, perfecting this website, setting up Twitter and Instagram accounts and more. A lot of this social media stuff is totally new to me, similar to the part of the movie at the Witch's Castle: exciting and scary. Today you can go to Amazon or Dark Ink Press and actually order my book! 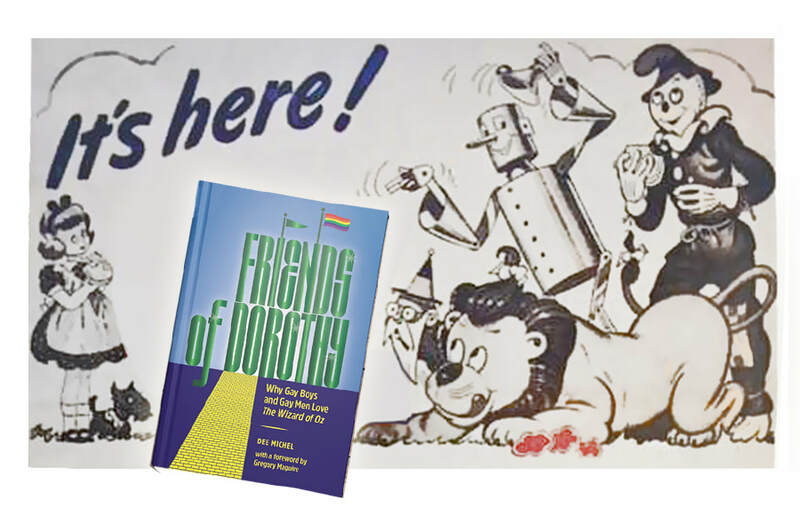 I can’t believe “Friends of Dorothy” is now actually published. It feels unreal. Quite a few friends have already pre-ordered the book, which makes me very proud and happy. There is still a lot of work to be done. An alternative to Amazon will be available soon, as will digital versions to download. Thanks to International Wizard of Oz Club friends, Willard Carroll, Bill Beem and John Fricke, I found out that the “It’s here” graphic is based on an advertisement in the Sept. 12, 1942 Detroit Times for Oz Peanut Spread, sold by Swift & Company. 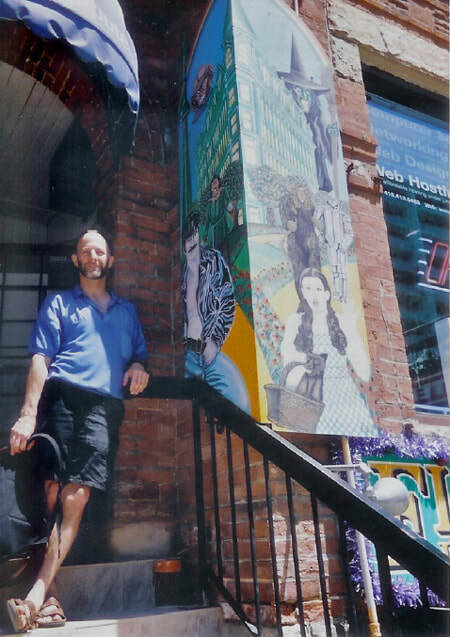 Outside a gift shop in Toronto’s gay neighborhood. Researching, writing and getting this book out there has been a long process (twenty years! ), but things have accelerated in the last few weeks. As a first time author, I thought readers might be interested in the process of writing, publishing and marketing my first book. As well as reflecting on the past, I will be talking about what is happening currently with the book: readings and other special events. So, what is the story with Oz and gay men? It’s not simply a matter, as many people assume, of gay men being into Judy Garland. I have interviewed over 100 gay Oz fans and it turns out gay men are also fans of the Oz books, as well as Wicked and The Wiz. Also my respondents became fans when they were as young as 3 or 4 or 5 years old. Even if their first exposure to Oz was the MGM film with Judy Garland, they were not signing on to fandom because they gave heard that Judy is a gay icon, or that they themselves were aware of being gay. Something is going on at a much deeper level. Themes of all sorts in stories set in Oz resonate with young gay boys. 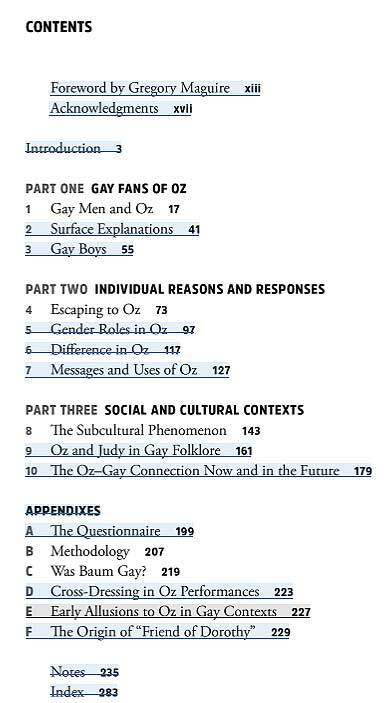 “Friends of Dorothy” details the existence of the Oz-gay connection, presents responses of individual fans to Oz stories, and then puts the phenomenon of gay love of Oz into a broader social and cultural context. Stay tuned and I look forward to your responses here! 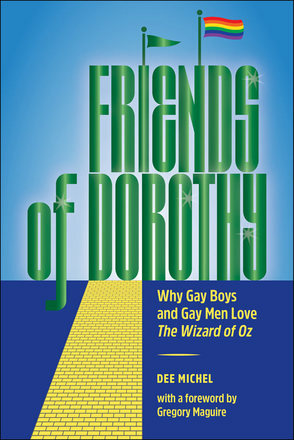 Dee Michel is the author of the book "Friends of Dorothy - Why Gay Boys and Gay Men Love The Wizard of Oz."